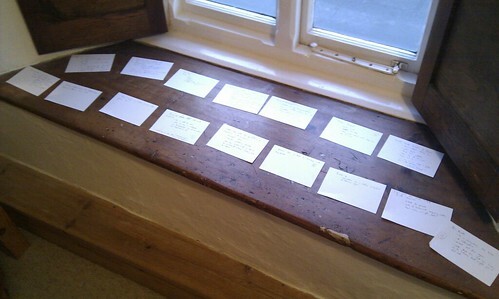 I spent the last week at a writers' retreat in Devon, getting the first draft of my novel into shape. 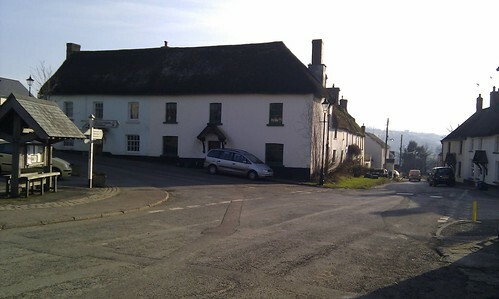 The retreat was run by the wonderful Deborah, a freelance journalist and writer, and her husband Bob, who open their gorgeous cob house in the small village of Sheepwash to aspiring writers who need a bit of peace, quiet and inspiration. And all their meals cooked for them: Deborah herself has written about how the decision to start a B&B was partly due to the effects of an empty nest, and to be honest, being looked after in this way was a total delight. Deborah encourages full board, and all meals are taken together. The food is homely and delicious, with homemade banana bread and flapjacks available as snacks throughout the day. Deborah cooks everything herself, and swears by the sense of fulfilment you get baking your own bread every day. 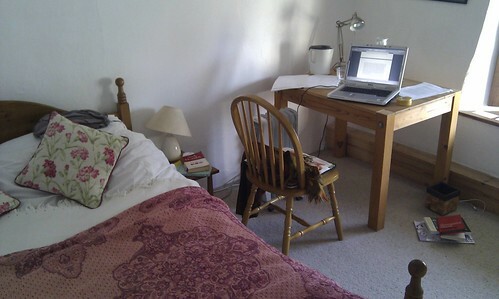 My stay here was the first long, extended period of time I've spent thinking about and working on my novel. I've been writing here and there, stopping and starting, spending the odd day in the library and scribbling notes on the bus, but it's not until you actually start writing, I mean really writing, that you discover how hard the whole enterprise is. I spent the first few days writing furiously, and my word count went pleasingly up. But on the third day, I started to flounder as plot overshadowed character, and I couldn't work out how to move things on. It's amazing how these thing interrelate, how plot cannot move on until character is developed, and sometimes, vice versa. I studied English literature at university, and to be honest, I thought I knew it all. How to pace and structure a plot; how to delineate and develop character; how to obfuscate and unveil meaning; how to write well, basically. But it's not until you actually give it a go yourself that you understand the real craft involved. This might sound silly, but making stuff up – and I speak as quite an accomplished liar – is really, really hard. Feeling your character run off the page and disappear as your fingers grind to a halt and hover above your keyboard is nothing but demoralising. And starting at page 1, chapter 1 of a potentially 300-page book is daunting, let me tell you. So having other writers to talk to, and discuss your work with, was almost as useful as having the time to think about it in the first place. The other guest staying at the same time as me, Alex, was writing a book about her time in the countryside protest camps in the mid-nineties, and we talked about how tricky it is to write up one's own experience as fiction. Every evening at 6, Deborah would open the wine, and we'd eat dinner and discuss our day’s work. We did readings of our work by the open log fire some evenings, and pushed back the tables and laid mats down for yoga on others. I'd go for walks to clear my head, and ideas would pop into my head while I sat on a bench by a river, or stood looking at gravestones in the village churchyard. For the first time I started properly to flesh out my main character, and rather symbolically, named her something other than Kat, or (me), as she had existed so far. She's got a bit of a life to her now: some of it made up, some of it mine, but stretched and distorted to provide the kind of contours a story needs to hang on. I've got the makings of a story, though I'm worried it needs a bit more drama. I've learnt here though that the only way to find out is to write it, read it and redraft. No more preparation and sharpening pencils. My aim is to have the first three chapters done by the end of February, and a whole first draft done by the end of this year. That's about 2,000 words a week (aiming for 80-90,000 words, and yes, it takes at least that long alongside a full-time job). I'll keep a tally and update on my progress here every week from now on. Word count can be a useful measure, but I've also learnt this week it's not the be-all and end-all: sometimes taking a step back and just thinking, wrapping yourself up in the story is important, too. And if I can afford it, I'll definitely go back to Sheepwash for some dedicated time on it, or a reappraisal or bit of space to think, whatever's needed. And if you ever need some time away, or a bit of a new angle on things, I recommend you do too. 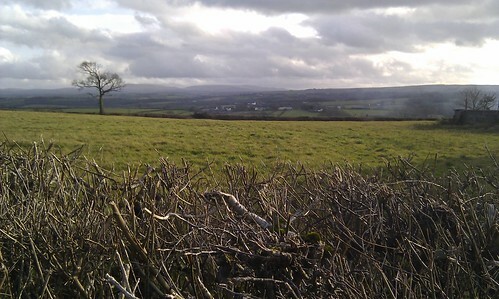 Retreats for You is run by Deborah Dooley and is based in Sheepwash in Devon, about 45 minutes' drive from Exeter.